If you want a good plot and character development, Priest is definitely not for you. If you want some cool fight slow-motion sequences, Priest has a couple of them. You definitely need to look out for the scene where Paul Bettany fight the vampires with darts-throwing, Maggie Q helping Paul Bettany with stepping stones fight the some kind of vampire beast guarding the nest, Maggie Q killing familiars from the train and lastly, Paul Bettany fighting Karl Urban (The Hat) on top of the moving train. All those shots and the 87-minutes long made the movie bearable. 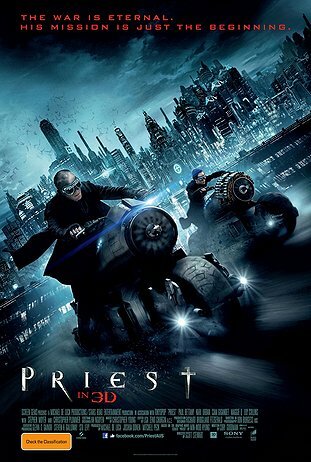 A group of priests fights to keep human safe and one of them fallen. With victory the priests returned to the city and treated as the bottom of the society chain. Head of the church took all the credit from the killings. The priest went to the church for permission to inform the public and allow him to go after his niece taken by the vampires. Instead of believing the priest, the monsignors treated the priest as a traitor. Typical hero story. Stephen Moyer only played a small part in the beginning of the movie but he always has the same expression as he had in True Blood. Cam Gigandet is way too cute in this movie. The strong sheriff character doesn’t really fit him but the funny shy guy in Burlesque was perfect.